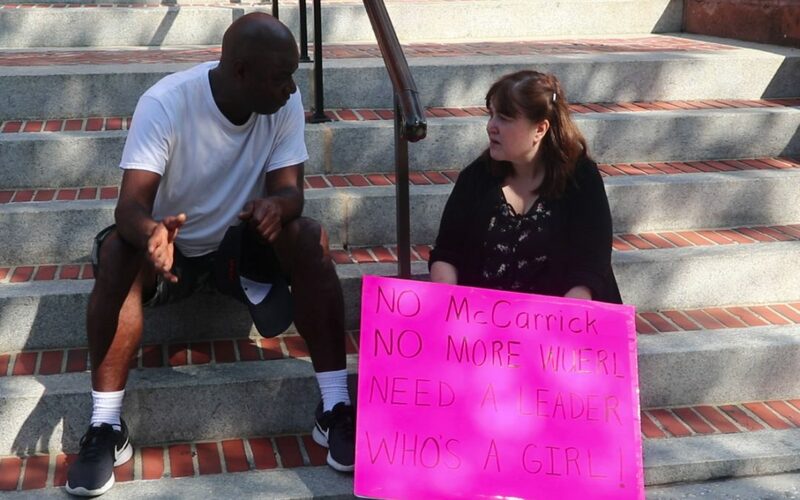 WASHINGTON – Around 40 demonstrators gathered outside the Cathedral of St. Matthew the Apostle Sunday morning, imploring Archbishop of Washington Donald Wuerl to resign. After the release of the grand jury report on Aug. 14 about 300 Catholic priests sexually abusing children for seven decades across Pennsylvania’s six dioceses, Catholic Churches have faced increasing criticism. Demonstrators demanded that Bishop David Zubik in Pittsburg, one of the six dioceses, and his predecessor, Wuerl, now Archbishop of Washington, resign over the abuses. Child sexual abuse survivors and their family members shared how they are still plagued by horrible memories and how hard it is to get over what happened. An abuse survivor from Bowie, Maryland, David Lorenz, a 54-year-old engineer working at NASA’s Goddard Space Flight Center, said he was abused when he was 15. After he came forward in 1992, he had to switch to different Catholic churches because he felt ostracized wherever he went. When Lorenz ultimately left the Catholic church, he devoted much time advocating for support for survivors. He founded a national organization of survivors of priest sexual abuse, known as SNAP, to help victims heal from past trauma. “Your life will be transformed. It won’t be ruined,” she said. Another child sexual abuse survivor, Mary Corzine, 63, a retired nurse from Silver Spring, Maryland, said the extensive investigative reports in 2002 about Catholic church child sexual abuses brought up a lot of her memories she thought she had dealt with, but had not. “Part of my healing journey is to help other victims and push a change in the church,” Corzine said. She spent much time lobbying around on Capitol Hill and trying to support victims who are suffering from depression, PTSD, drug addictions, and domestic violence. “Once they get helped, they can do very well,” Corzine said. It is positive that there were many revelations about bishops and hierarchy in the church, she said. “But I don’t see anybody stepping down. They were contrite, and have been saying sorry for years, but we demand more than just saying sorry,” Corzine said.